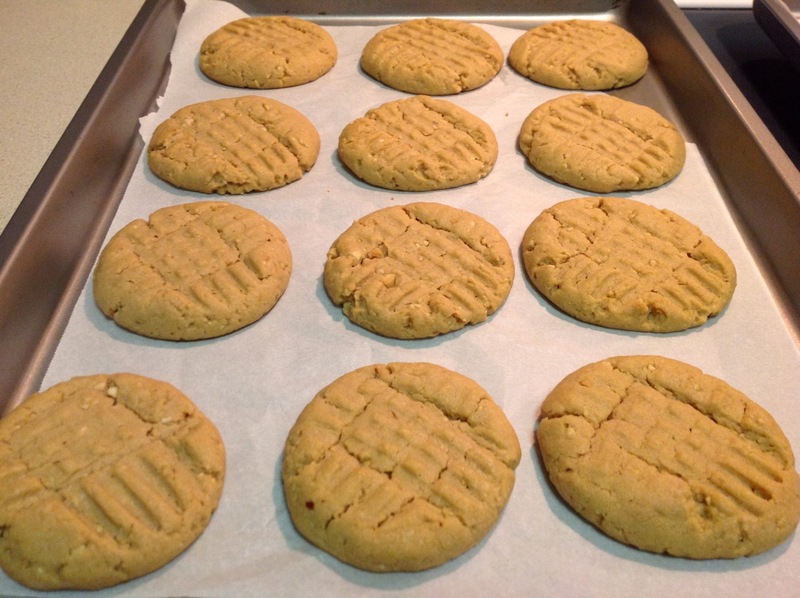 Peanut butter cookies were the first thing I ever learned to bake. I used the Betty Crocker recipe, being careful to add equal parts margarine and shortening to the ½ cup measuring cup (not sure why I didn’t just use a ¼ cup). We had an old brown hand mixer from the ‘60s or ‘70s that I would use to cream the fats and sugars before adding the dry ingredients. I’m sure it made a terrible mess, but that’s par for the course when you’re 10 years old. Today, I do things a little differently. I’ve moved on from margarine, shortening and Betty Crocker in favor of European-style butter and America’s Test Kitchen, which imbues peanut butter cookies with extra peanut flavor by adding ground peanuts in addition to chunky peanut butter. One thing about this recipe I changed: While I welcome how saltiness can enhance sweetness in baked good, I thought they went overboard with salt on this one. So I used unsalted butter and nuts rather than salted ones as called for. I also used an organic creamy peanut butter instead of the Jif crunchy peanut butter they call for just to try something different. 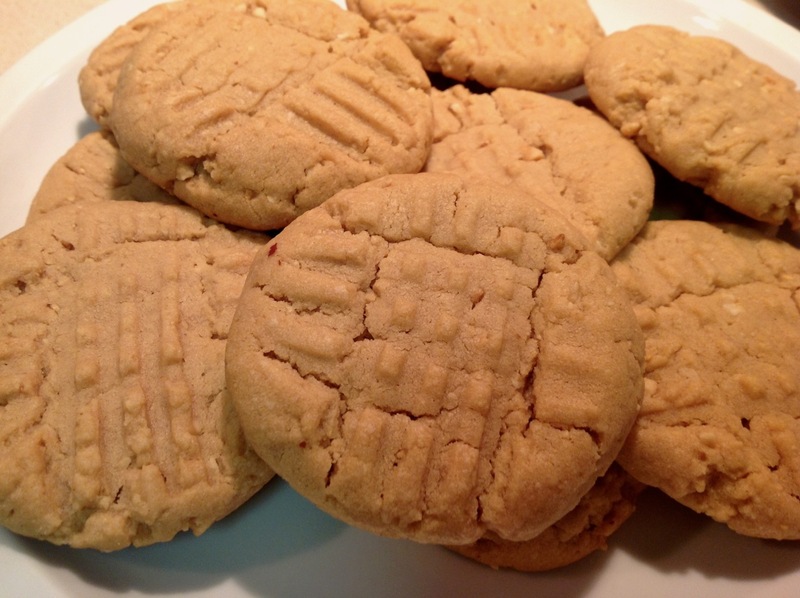 I happen to really love Jif crunchy peanut butter (it’s our household go-to peanut butter), so for the recipe below I say you may use either. The net result of my changes is that each cookie from the recipe below will have about 95 mg of sodium instead of 175 mg in the original recipe. 1. Adjust oven racks to upper-middle and lower-middle positions. Preheat oven to 350 F.
2. Beat butter on medium-high speed with a stand or hand mixer until creamy. Add sugars and beat until fluffy, about 3 minutes, stopping to scrape bowl as necessary. Beat in peanut butter until fully incorporated, then the eggs, one at a time, and last the vanilla. Add the ground peanuts and stir gently to incorporate. 3. In a separate bowl, whisk together flour, baking soda, baking powder and salt. Stir dry ingredients into the peanut butter mixture. 4. Line two baking sheets with parchment or silicone baking mats. Roll dough into large balls, about 1 ½ inches across (about 2 tbsp. of dough per ball). Position dough balls about 2-3 inches apart on baking sheets. Press the tines of the back of a fork down on the dough to flatten, making a hatch pattern on top of each cookie. Dip the fork in flour if it gets too sticky. Bake about 10-14 minutes, rotating baking sheets top-to-bottom and front-to-back about halfway through, until cookies are puffed and slightly browned around the edges (cookies will be soft in the center, but will continue cooking a bit when removed from the oven). Allow cookies to cool a few minutes and then transfer them to a wire rack to cool completely. Store in an airtight container in the fridge and eat within a week. What a cute mental image: Ten-year-old Andrew making cookies in his mom's kitchen. I'm very happy you've mastered the art of the peanut butter cookie. I always look forward to eating them.